It has been a long time since Talsa, a producer of machinery for the meat industry, once decided to trust Aitana Multimedia to be one of its technological companies providing support. This company would be in charge of presenting on the Internet all of Talsa’s products and later on developing the application to manage its distributors. Likewise, Aitana can say that Talsa has become one of its VIP and closest clients. There has been from the beginning a reciprocity in the way they both understand work, the thoroughness they do it with and their respect towards boundaries; getting pleasure from a job well done, and a virtue that accompanies us from the beginning: loyalty and trust. And once more, we are working side by side with Talsa on their new web project and a new order app for distributors to manage all orders of machinery and spare parts. We consider Talsa to be a tireless worker always aiming towards excellence, always investing in expanding itself and working on its goals. Talsa is a company that characterizes for its dedication and perseverance, with a great team of technical professionals always working on a project and never diverting from the right track. They keep their eyes on all important aspects including production quality, but never leaving aside the human aspect. Talsa’s ability to keep its employees happy is also an incentive to maintain production quality as reciprocity. Behind every achieved goal there are hours of exhaustive work. Thus, it is no surprise that Talsa has become a renown brand in Spain and the world. Its distributors make their agility and good, responsible service seem easy. Talsa talks less, concentrates on the important and produces the right way and in an orderly manner. 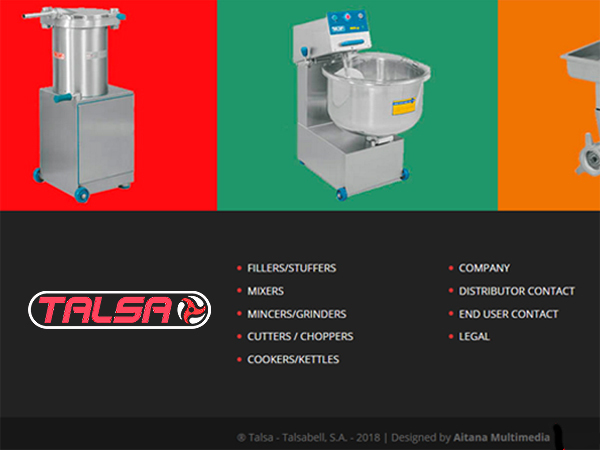 Its medium range machinery: fillers, mixers, mincers, cutters and cookers are the result of over 100 years’ experience of the Talsa brand.